Discerning a call to the Dominican Sisters of San Rafael is a process that involves a woman and the vocation minister, who represents the congregation. It starts with a very simple first step: getting acquainted. We can arrange for opportunities to get to know the sisters in a variety of ways. If you would like to learn more, please see how you can become acquainted with us and learn the steps of the process. Nourishment is basic to our human needs. It evolves into community service as sisters move from the convent to a local charity. Claire and Lorraine spend each Wednesday at St Vinnie's Dining Room, serving lunch to those with no other options of nourishment. An invitation to work for 'the culture of encounter', in a simple way, 'as Jesus did': not just seeing, but looking; not just hearing, but listening; not just passing people by, but stopping with them; not just saying 'what a shame, poor people! ', but allowing yourself to be moved with compassion; and then to draw near, to touch and to say: 'Do not weep' and to give at least a drop of life. Dominican women and men, vowed and lay, young and old are found in over 100 countries. In late August 1850, Joseph Sadoc Alemany, OP, a Dominican Friar and the newly named Bishop of California, traveled to Europe to invite religious women to provide a Catholic education for young women in a very wild and uncivilized California… of the Gold Rush days. One of his first trips was to The Monastery of the Cross in Paris. There he met Sister Mary of the Cross Goemaere, OP, a Belgian novice. She volunteered to accompany him and another Dominican, Francis Sadoc Vilarrasa, OP, and on December 6, 1850 landed in San Francisco. In spring 1851, Sister Mary settled in Monterey, became prioress of the first group of women religious in the new state. 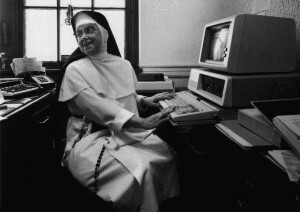 Sister Alicia uses one of the first computers in the 1980's as a way to track inventory. In 1854, the sisters moved from Monterey to Benicia because it seemed to offer a more promising future for a school than Monterey and because alemany's newly divided diocese no longer included Monterey. The school and convent were named St. Catherine's Academy. Mother Mary continued to guide the sisters and to instill in them a sense of Dominican life and apostolate. Elected in 1887, Mother Louis O'Donnell, determined that San Rafael would be a more promising location for leadership, novitiate and school to relocate due to the proximity to San Francisco. With tremendous faith, generous donations, and pledges of financial support, Mother Louis arranged for the construction of a new Victorian-Renaissance style building which became Dominican College of San Rafael. Although some sisters remained to run the school at St. Catherine's in Benicia, they tearfully bid goodbye to the entire novitiate and several professed sisters who set out by schooner to being ministry and community life in San Rafael. Through the next century and a half the Dominican Sisters expanded their service throughout the state of California and into northern Nevada. Their ministries shifted after Vatican II council to those in which preaching, justice, truth and love took form. Though much in the life of a Dominican sister has changed over the last 50 years to meet the modern world, the love of contemplation and seeking harmony in nature remamain constant. In 1990 the fire that destroyed our 100-year-old San Rafael motherhouse brought forth a new creative configuration of our sisters living spaces and administrative offices, the Dominican Sisters Center, which opened in 1995. Among the events hosted at the Center is Gather@Grand, a monthly lecture series offered to our local Marin community on issues of spirituality, culture and justice. Check the calendar for the latest events.